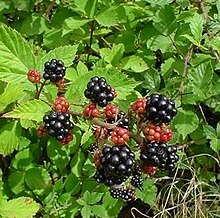 From Middle English blakberie, blakeberie (“brambleberry”), from Old English blæc berġe, blæc-berie (attested in plural blace berġan, blace berian (“brambleberries; blackberries”)), equivalent to black +‎ berry. A fruit-bearing shrub of the species Rubus fruticosus and some hybrids. The soft fruit borne by this shrub, formed of a black (when ripe) cluster of drupelets. (Britain, in some regions) The blackcurrant. To gather or forage for blackberries. Thereafter we blackberried unceasingly and returned with a large basketful, together with some maggoty windfall apples found neglected in the wet grass on the edge of an orchard and Mrs Clare duly stewed these for us. My mother and Cordelia were blackberrying along the woods edge of a nearby meadow. My wife and children were blackberrying at the end of the garden and I was simply reading. Another instance of someone who is blackberrying and sees fairies can be found at Kingheriot Farm (South-West Wales: Pembrokeshire): maybe gathering berries puts the percipient into a relaxed or dissociated frame of mind, more conducive to being able to see things that one would perhaps not normally be able to see. This page was last edited on 19 February 2019, at 05:23.